I have to say that I was initially a little doubtful about putting this post together. I had no issue when it came to talking about Autumn/Winter 2018’s trends (you can see my post here), but I’ve actually really struggled with Spring/Summer 2019. I partly have myself to blame, because I’ve become so lazy about checking runway collections and I rely mainly on social channels to see what’s popular – but I have to say that I genuinely don’t think that there is (for now) much of a difference from Spring/Summer 2018. This is not at all a bad thing; I personally loved last year’s vibe and am more than happy for it to continue. Brands like Realisation Par, Reformation, Verge Girl, With Jean and Sezane have really been setting the mood over the past few years with their ethereal and effortless style ethos – think St. Tropez (the epitome of chic holiday style in the seventies) vibes with rattan accessories and the right amount of statement (preferably gold) jewellery. A mood, or vibe (a term that millennials and Generation Z peeps seem to love) is such an abstract concept when it comes to fashion. As a highly visual and creative person, I totally get why designers make mood boards – it makes so much sense to collect all kinds of images, group them together on one surface and create a collection from there. But because I’m not necessarily great at collages and copyright issues could arise when making a public mood board, I’m going to do my best to explain what I think Spring/Summer 2019’s mood. 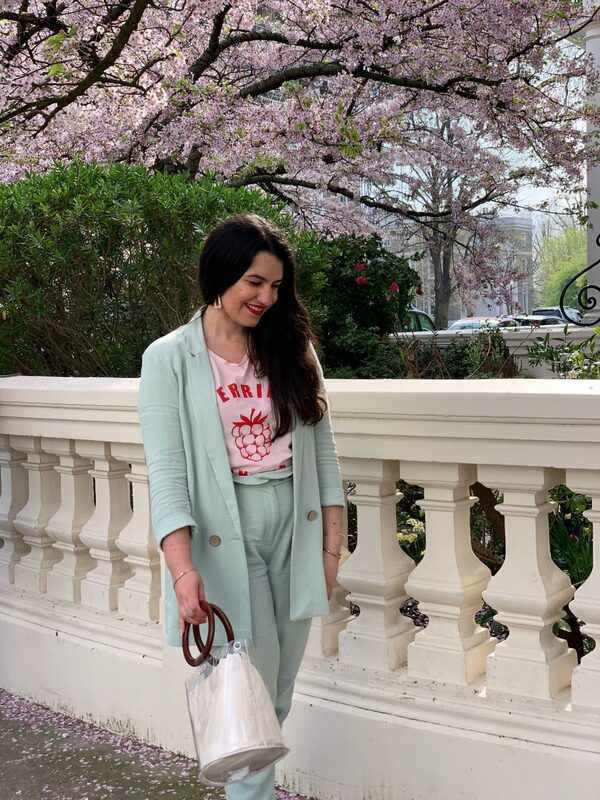 I believe the brands I mentioned earlier have had a big impact on lower price-point brands and street style, and because to some extent these brands are very much inspired by cuts and style moods from another era, that seems to be the overall vibe reigning. Look to the likes of sixties/seventies singers, It Girls and enduring style icons Francoise Hardy and Jane Birkin – if you start looking up pictures of them on Google you may never stop. Simplicity is key, but that doesn’t mean you have to be boring. Style is in the detail – be that some tortoiseshell buttons, big earrings or pretty cuts in your top. Nature takes centre stage in fabrics, accessories and even tones, as earthy hues are the epitome of chic. It’s about looking effortlessly chic, even though achieving that look can take a lot of thought and careful consideration. As well as St. Tropez, imagine going on a luxury retreat to Marrakesh, Cinque Terre, Madeira, Marseille or even somewhere in the desert – that’s the vibe. Abstract? I know. 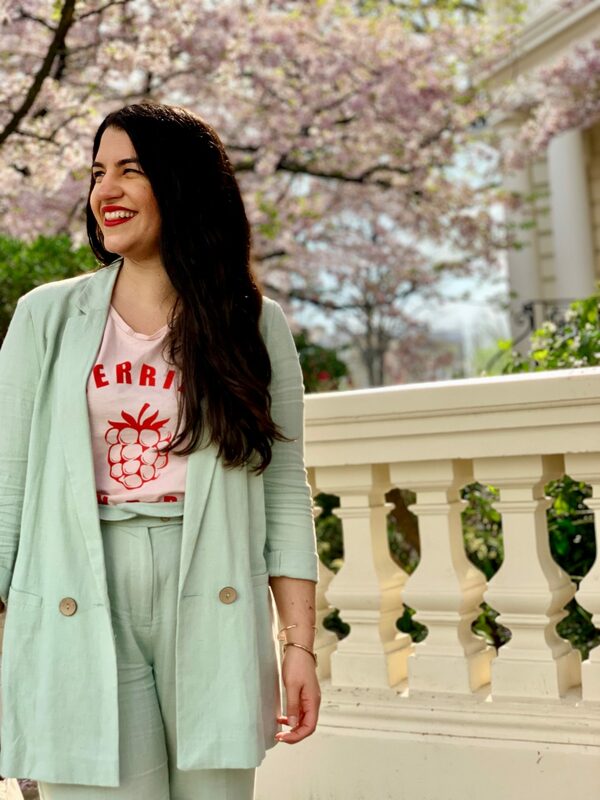 Instagram accounts to follow to get the mood for SS’19: @francescasaffari, @thatsaleaf, @bubblyaquarius, @nicoleballardini, @glameramo, @styleturbine, @brittanybathgate. Neutrals, neutrals, neutrals. Beiges, whites, off-whites, and creams have been dominating the feeds of many an ‘influencer’ – and I can totally see why. It is definitely the quick-fix to looking instantly put-together yet effortless. It goes wonderfully with gold jewellery, and will instantly enhance your tan (or maybe even make you look like you have a tan). 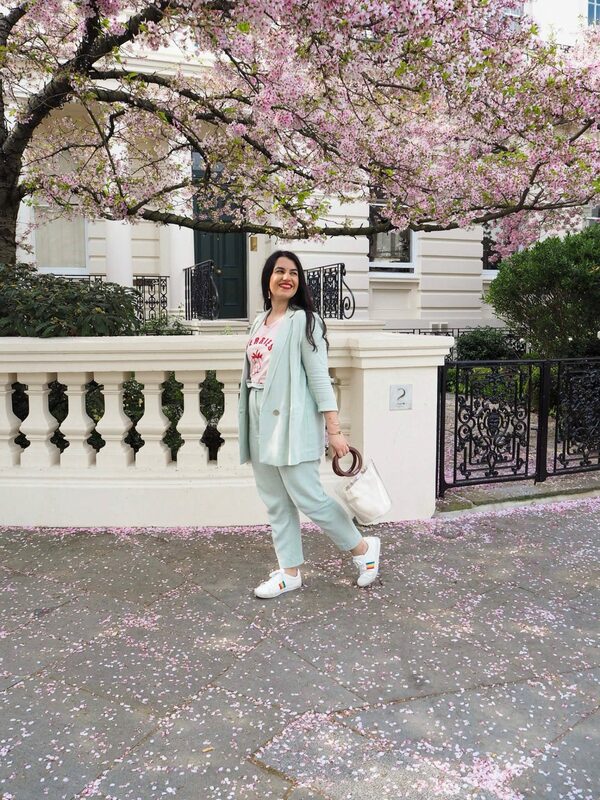 Pastels, which I adored so much back in the day, seem to be having a moment this SS’19 too (with sage green at the forefront, which judging from the pictures in this post I suppose you could say I’ve embraced because it’s very much like mint) – perhaps because they complement creams and whites perfectly. Rust shades, which I consider beautiful and yet have none of in my wardrobe, were quite big in AW’18 and could easily work with the neutral hues of SS’19. Those who perhaps prefer a sharper, more contemporary feel and gravitate towards pieces and outfits that have a sport-luxe vibe might be drawn to the little splashes of neon I’ve been seeing here and there – it’ll be interesting to see if neon does become big over the next few months. To be honest, I don’t think patterns and prints are going to be that big for Spring/Summer ’19 – the neutral palette is so strong at the moment that prints seem to be taking a seat back. Animal prints – especially snake print – have watered down into this season, but I suspect that it was so overdone throughout winter that people are close to done with it. However, there is one pattern that is set to be big – and that’s broderie anglaise. Although technically not a pattern, but a needlework technique, it’s been around for centuries and has definitely earned itself the title of a timeless look. It tends to be available every spring and summer, but you’ll be seeing even more of it in 2019. Sketch-like face prints and sketches of the female body are still lurking around, although they now seem to be more popular in the form of art prints. Of course, it wouldn’t be spring without florals, so if that’s your thing you’ll definitely be able to get your fix. I’ve also seen gingham pop up here and there – I love those picnic vibes and would love to find the perfect gingham dress one day. And if you’re a lover of all things nineties, the return of tie dye might be right up your alley – personally, I’ll be avoiding it like the plague. I don’t know about you, but I’ve always associated linen with clothes that keep you cool but don’t look that cool and are popular with the older crowd. But somehow linen has had a glossy makeover, becoming the star fabric of the SS’19. 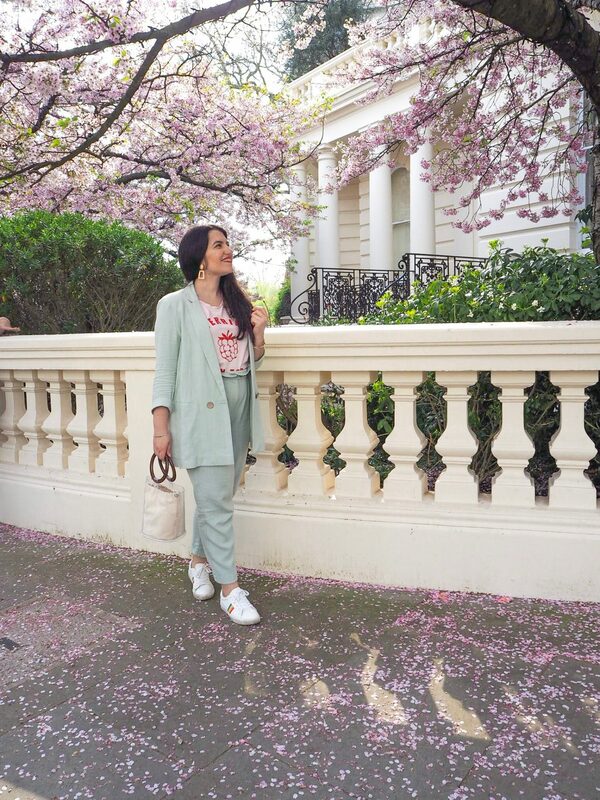 I’ve quickly become a convert thanks to this cute suit from Primark, as this natural fabric – it’s made from the flax plant – keeps you cooler than cotton and can look great when given a contemporary twist. I don’t know if I’ll be getting myself a linen shirt, but would love a pair of linen shorts. Hello creases and breathability! This is the area in which I feel there isn’t a huge variety from Spring/Summer ’18, which I definitely think is a good thing. Cutsie dresses with vintage details, such as puffed or balloon sleeves and a front button fastening, were big last year and will continue to reign this summer. What I have noticed though (and I did mention this in my SS’18 report – I was ahead of the times!) is that square necklines on both tops and dresses could really become the neckline of the season. 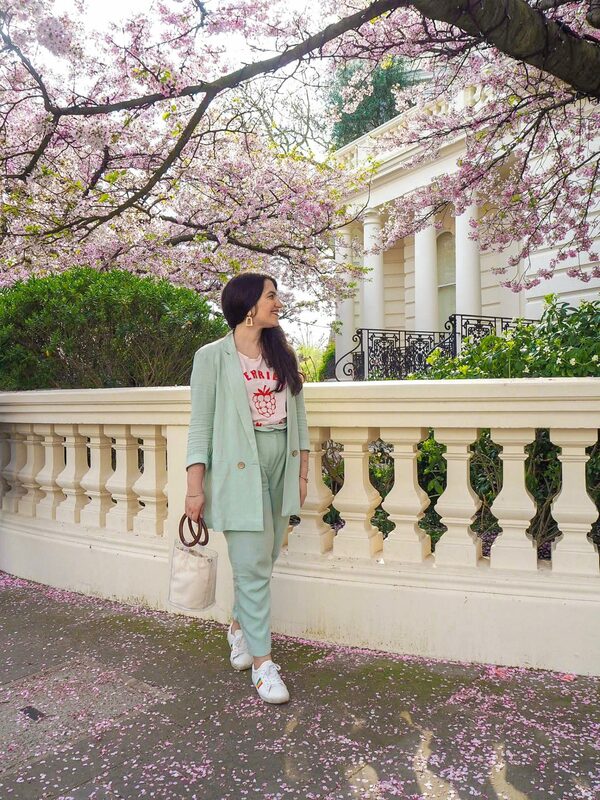 This very much ties with the Milkmaid look, a word that I love and find hilarious on equal measures – even though I can’t take it seriously, you’re going to spot it on pretty much any online fashion store at the moment. What does it involve? Usually a square neckline, possibly some broderie anglaise and some form of a voluminous sleeve. Ever since Alexa Chung brought out this blouse with Marks & Spencer, the Victoriana/poet/peasant top has been a recurring theme every Spring and Summer – with statement blouses and shirts featuring ruffles, frills, laser cut details, embroidery, fluted sleeves, trumpet sleeves, and/or balloon sleeves making a steady appearance. I for one have not tired of this look, which has a slightly dramatic flair – the possibilities of it are endless. 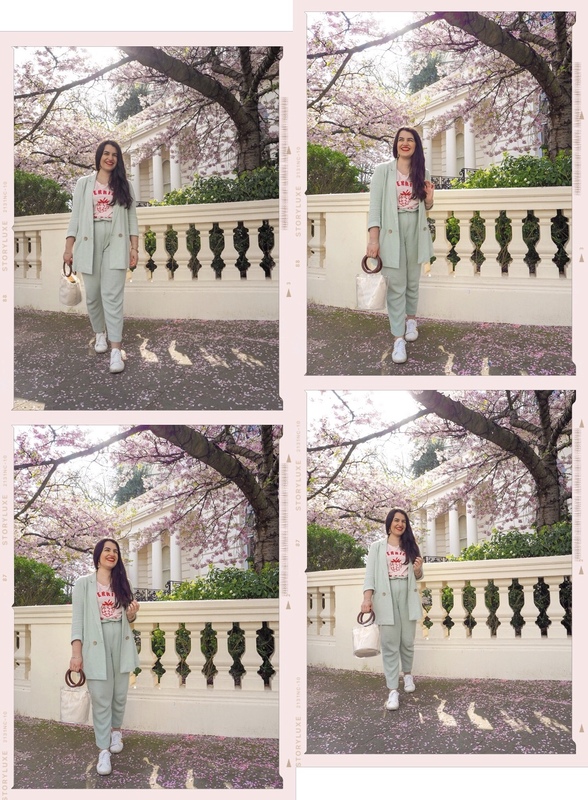 Suits, a look I have been a fan of for quite a few years, were super popular last spring (because millennials love a good coord) and are also looking to be big for SS’19. And while the Clueless vibes are still about, keep it plain, neutral or pastel if you want to feel at the top of your fashion game. 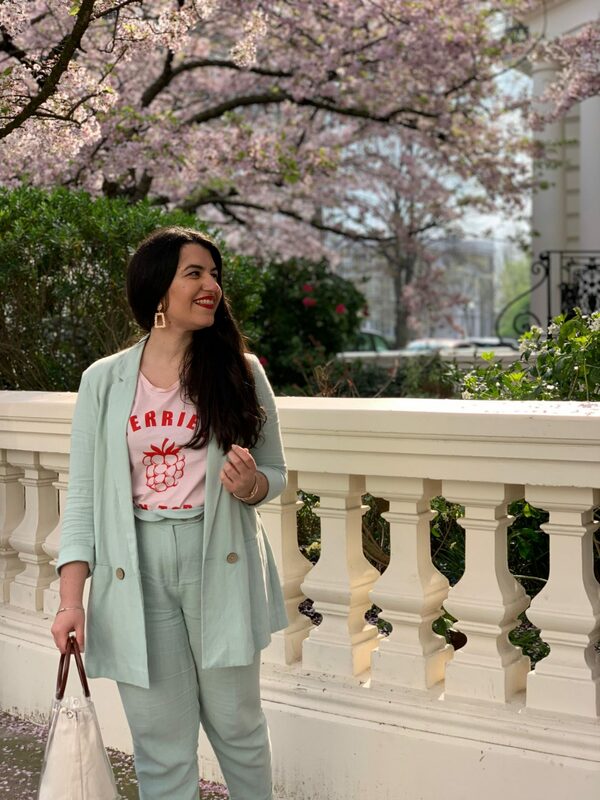 The humble cardigan was pretty huge in AW’18 (all the cool girls were wearing cardis as tops) and is set to stay big this season too – a cover-up which is quite frankly perfect for countries like the UK (in which outerwear is usually necessary even throughout the summer). White and cream jeans, which were once considered a big no-no and hated by the press (I remember how back in the noughties model Elizabeth Hurley was ridiculed for wearing white jeans, even though she looked fab in them), have now become a bit of a must-have for the in-the-know fashionista – try wide-legged cream jeans if you dare for extra style brownie points. Satin skirts were another big hit for AW’18, and it’s likely they’ll remain popular throughout the cooler months too. Shorts also seem to be making a big comeback in neutral hues and softly-tailored-yet-kinda-relaxed cuts – as someone who used to wear shorts ALL THE TIME, I am delighted. I’ve got one word for you that is technically two: hair clips. I spoke about them here and have to reinforce their presence as they just seem to be getting more popular by the minute. It makes sense, as it’s such a democratic trend – they can look great with long hair, blunt bobs (the hairstyle of the moment) and even girls with pixie cuts. I adore this trend but for some reason still haven’t given it a go – I think a part of me feels I’m too old for it (sob) and that they will disappear as quickly as they appeared on the scene. I do hope I’m wrong, because I suspect that sooner or later I’m going to cave in! I did cave in to the hairband trend (as seen here), which I’m sure will carry on throughout the summer. And as for jewellery, I (really) have got one word: shells. Shell earrings, shell necklaces, shell bracelets, shell rings and even shell anklets are everywhere at the moment. Due to their ‘natural’ vibes and creamy hues, they match fashion’s current love affair with neutrals perfectly. Whether you take it literally and dip into the cowry shell trend (I love it and might even write a separate post about it) or go for jewellery that emulates the shape of that iconic Venus shell, the world is… your oyster. Raffia earrings (which I talked about here) are still looking to be very popular – and let’s not forget how layering your gold necklaces is still very much a thing. The raffia look seems to be showing up on SS’19 shoes too, and I’ve noticed that Zara currently has a lot of shoes encrusted with cowry shells. But the one shoe trend that is really taking off is the nineties throwback strappy sandal, with brands like Staud and Rejina Pyo bringing out pretty desirable versions. I don’t mind this look on either people but I definitely won’t buy into this trend – I’m not a fan of sandals in general and as I don’t like having my feet on show these are the equivalent of a nightmare for me. I’m giving bags a section of their own because I’m 100% partial – I’m a bag lady through and through. But like I’ve said a few times throughout this post, there’s nothing too new in the SS’19 bag department. Again one word that’s really two: basket bags. They took the fashion world by storm in 2017 and it doesn’t look like they’re going anywhere. Circled, squared, literally the shape of a basket – I adore this trend and love how they now come in all shapes and sizes. Vintage and artsy looking bags are also very much a thing – and when I say vintage and artsy I’m thinking brands like Staud (bucket bags encased in macrame and perspex bags), Rejina Pyo (gorgeously flat box bags), Mehry Mu (beautiful little bags with rattan surfaces and shapes that are worthy of a Man Men revival), Danse Lente (defined and striking silhouettes with sharp and graphic details), Simon Miller (cylindrical bags with round enamel handles), Meli Melo (bucket bags and other cuties) – über cool, somewhat lesser known mid-designer names that are looking to decades like the fifties, sixties and seventies for inspiration and making the coolest bags. For better or for worse, the high street has taken note. Maybe you like to invest, maybe you’re a high street girl or maybe you have a good eye for actual vintage bags – whatever your preference, there is a wonderful selection out there. Jacket, trousers, earrings and bag, Primark. T-shirt, Kaffe (from last year). Shoes, New Look (seen here). Bracelets, gift, The Peach Box, French Connection. And that’s it! I find it hilarious how I’ve managed to write so much about Spring/Summer 2019 when I initially felt there wasn’t much to say… LOL. I still believe that things haven’t differed greatly from recent years, although this year it’s refreshing to see that accessories really are the stars of the show, with outfits, in one way, serving as blank canvases. However, SS’19’s mood is not about minimalism – it’s about effortless simplicity and soft hues with interesting details and touches that can add a stylish and even dramatic flair. Also, I think a lot of the trends I’ve pointed out here could work together, and have the potential to become timeless pieces. 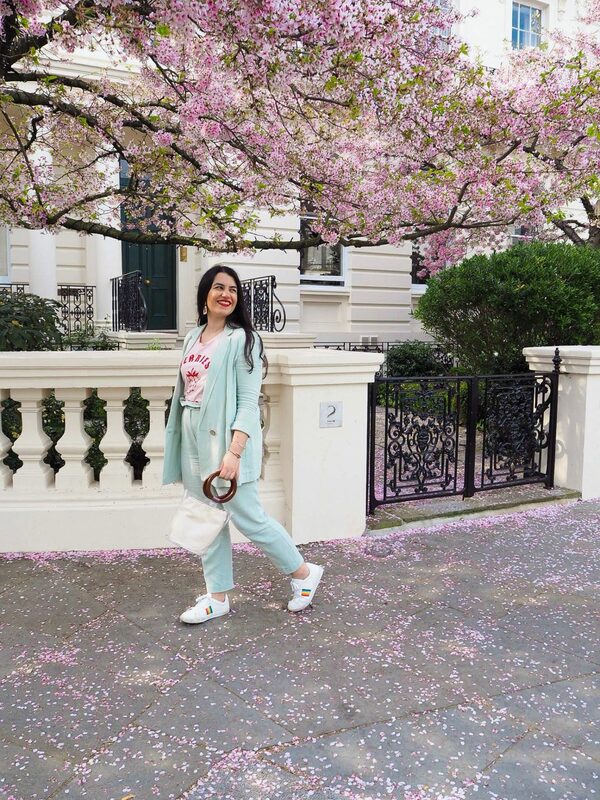 Because let’s face it – trends are fun, but ultimately it’s about wearing something you love regardless of what’s “in” and hopefully having something for more than just one season! 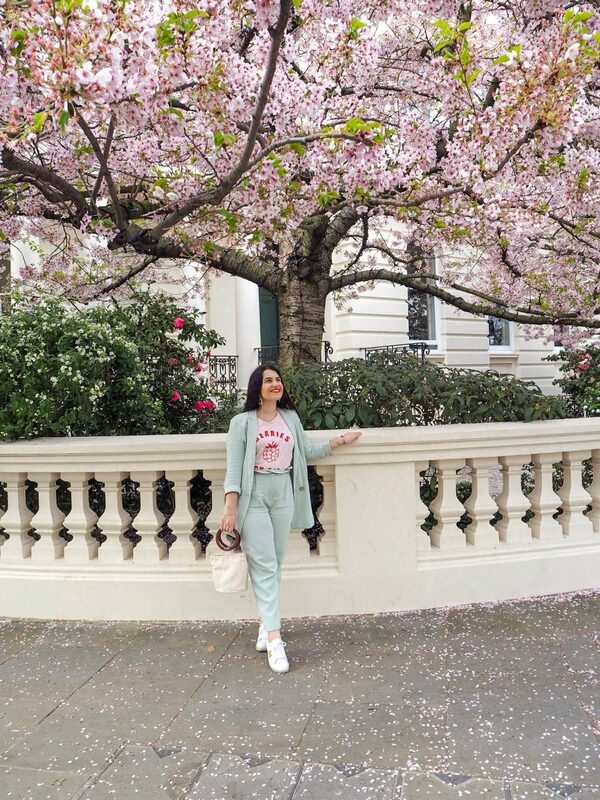 Pictures taken in Notting Hill, west London, on March 30th, 2019.